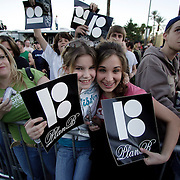 TO LICENSE OR PURCHASE A PRINT, SIMPLY ADD AN IMAGE TO YOUR SHOPPING CART. 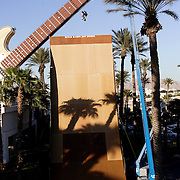 FOR MORE IMAGES FROM THE JUMP, PLEASE SEARCH MY ARCHIVE FOR "DANNY WAY". 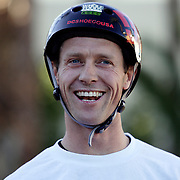 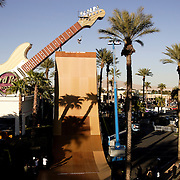 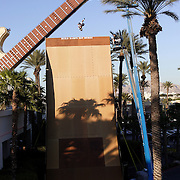 Professional Skateboarder Danny Way set a Guinness Book of World Record for biggest "Bomb Drop" when he leaped from a platform atop the guitar at the Hard Rock Hotel and Casino in Las Vegas, Nevada on April 6, 2006 and landed on the ramp over 70 feet below. 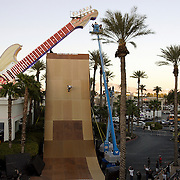 He then succeeded in landing in a second time to the delight of hundreds of onlookers.